Designed to be an entry-level “Career Ladder” program for recent college graduates to gain work experience and the job skills needed to seek a full-time position within Metro or another company. Establishes a pipeline for recent college graduates to gain entry-level or journey-level work experience as a Transportation Associate I.
Exposes recent college graduates to work assignments, projects and technical skills related to their college degree. Identifies a “pool of proven performers” who are eligible to “fill new roles” that fit job skills developed over time within Metro or at another company. 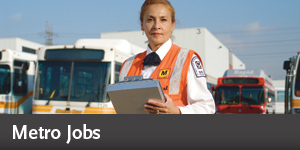 Offers recent college graduates an opportunity to become the next generation of Metro’s workforce. Recruit qualified applicants for entry-level work related to their college degree. Establish a “Career Ladder” program, which enables recent college graduates to qualify for an entry-level full-time position. Creates a “Career Ladder” position classification at an entry level to best fit Metro’s business. Graduated from an accredited college or university within the last two years. Obtained a GPA of 2.5 (undergraduate) or 3.0 (graduate) or better. Must be a U.S. citizen or a legal resident and eligible to work in the country as determined by the Department of Homeland Security and/or the U.S. Immigration Laws. Candidates for ELTP are subject to Metro’s pre-employment screenings, including a criminal background check. ELTP participants may work up to 40 hours per week. Pay rate is $22.14 per hour as a Transportation Associate I.
Metro does not provide paid vacation, holiday pay or flex time for participants. Participants must adhere to Metro’s dress codes, and observe all safety rules and regulations at all times.